We love Sony's penchant for crazy products like the P clamshell Android tablet, and who can forget the Rolly music player slash robotic, LED flashing... thing? Judging by a new speaker, the company still has a whimsical side despite falling profits. The SRS-LSR100 pairs a TV remote with a wireless speaker, which receives a 2.4GHz signal from dongle attached to your TV or stereo. The idea is to bring the TV sound closer to you, whether you're in the living room, exercise room or kitchen. And since you're there, why not have a channel-changer? Features include a headphone jack, large volume knob, auto power-off, drip resistance, minimal sound delay and 16-hours of battery life. Sony's marketing it as an easy way to hear TV when you're exercising, cooking poutine, or doing other noisy activities. It's also "useful when it is difficult to hear in conjunction with the family," according to the translated Japanese PR. In other words, when Grandpa tells you to shut up during his favorite program, you can just shove the speaker closer or hand him some headphones. 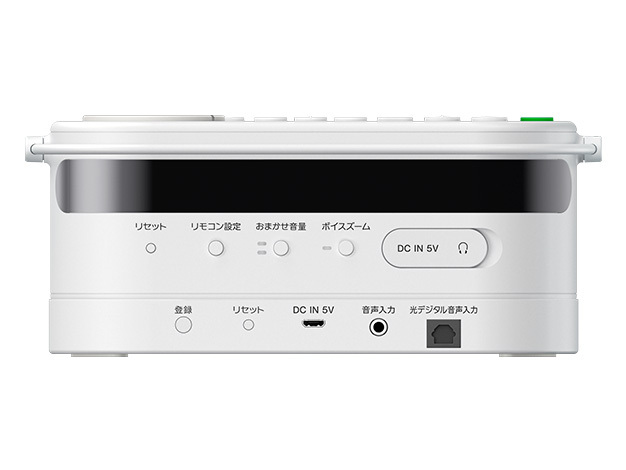 Which actually sounds pretty useful -- unfortunately, it's only coming to Japan (next month) for 19,880 yen ($170).